Demetra presents for the WSAA in Seattle, WA. Check their website http://waastrologers.org/ for more information on lecture and workshop topics and registration. A perspective on the tumultuous planetary interactions of 2020 as seen through the lens of ancient myth. Saturn (Cronus) devours his children out of fear that they will supersede him as supreme god. His sons Jupiter (Zeus) and Pluto (Hades) join forces to wage the Titanomachy, an epic ten-year battle against the autocracy of their father. They defeat the old Titan gods and institute a new Olympian reign as rulers of the universe. Demetra will retell the myth against the backdrop of the triple conjunctions during 2020, teasing out the timeless archetypal meaning embedded in the current events of our time. Cost: Free to watch during the live broadcast. $89 to $125 for the All Access Pass. 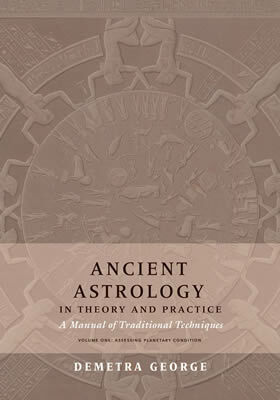 With the publication of Ancient Astrology in Theory in Practice: A Manual of Traditional Techniques (Vol. 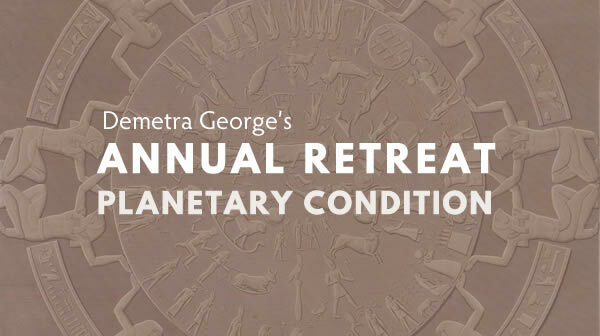 1), Demetra George is now offering a training program in the basic principles of Hellenistic Astrology which will consist of three consecutive retreats: Planetary Condition, Delineating Houses, and Hellenistic Time Lords. Demetra believes in the primacy of the personal connection between teacher and student as the optional way to transmit the teachings and insure that students correctly understand the material. An optional certification track will be offered for those who are interested. This first unit of the training - Planetary Condition - will be held in Bend, Oregon, a small town nestled along the Deschutes River in the eastern foothills of the Cascade Mountains. This is the foundation course for the study of traditional astrology and its integration into contemporary practice. The central question of the teaching is determining how the condition of a planet predisposes it to indicate the best possible outcomes of its role in the life of a person. You will be able to master most of the material contained in Volume One of Ancient Astrology during this intensive five-day retreat. aspects (configurations, witnessing, testimony, connections, enclosures, interventions, overcoming, and hurling rays, bonification, maltreatment). Using Ancient Astrology in Theory and Practice: A Manual of Traditional Techniques as the primary text, supplemented with readings from the books of ancient astrologers, you will learn how to bring all of these factors together in a powerful synthesis that unlocks the layers of the chart with unrivaled precision. Each day will include lecture, small group work, and application of the methods to your own chart under guided supervision. In addition, Alecs Garret will teach bonus sessions reviewing the previous day's teachings with Q&A, as well as offering individual tutoring as needed. There will be an optional field trip to an observatory for night sky gazing, weather permitting. In order to maximize the benefits of the teaching, you should have a prior basic knowledge of the meanings of planets, signs, houses, and aspects, as well as having looked at charts. This is not a program for brand new beginners. The optional Certification of Competency for each unit will be awarded with a satisfactory written and oral exam and submission of a paper. Participants who have attended previous retreats can receive credit towards certification and apply to take the exam. Greek Mysteries Tour to Greece May 15-28, 2019. Take a moment to browse the itinerary and consider joining a group of astrologers and their friends on a traveling symposium to the sacred sites of Greece. Substantial savings if you register by the Nov 15 Earlybird.